For those of you who are unaware of what Chormecast is, it is the latest in Google’s recent string of TV/internet-connected devices. 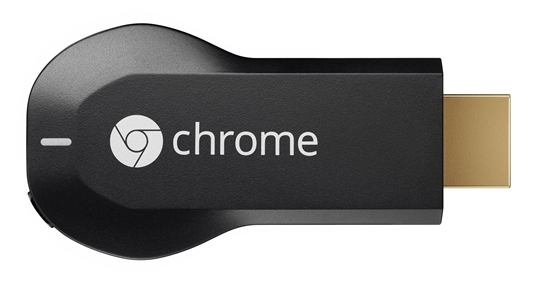 The Chromecast is a small thumb drive size USB stick that plugs into the back of your TV and allows you to stream video and content from your phone, tablet or computer to your television screen. The Chromecast device connects to your TV’s HDMI port and uses your Wi-Fi network to stream your videos, music, pictures etc. AS has been reading about it for a few months now and was annoyed that it was not available in Australia. He thought it would be great for us as we use an HDMI cable to connect our TV and computer. The bad thing about the HDMI is that it has a long wire gets disconnected easily if you move your laptop around With Chromecast this can be done wirelessly. Finally, Chormecast is available here and we got it yesterday. It is only $49 so not a big hole in our pocket. We set it up after work and it worked so well. It was so easy to set up. To set up Chromecast, all you need is a TV with an HDMI port, a Wi-Fi connection and either a computer with Google’s Chrome browser or a mobile device with Google’s Chromecast app. Simply connect the Chromecast to your TV’s HDMI port, visit chromecast.com/setup on your PC, download the app and follow the instructions from there. Now we can use the Chromecast with our mobile, tablets and laptop without connecting any wires and it’s available on iOS too. Chromecast also allows us to further multitask with our digital media; for example I could be using Facebook on my tablet while streaming a video to the TV simultaneously. I have to say it is one of the best devices we have bought and the price is just too good. This entry was posted in Technology and tagged chromecast. Bookmark the permalink.